This is my post about my 5 favourite Christmas decorations. If you can’t see the video please click here. If you’re not into Christmas please be gone now. We get very very VERY excited about Crimbo in our house, and that’s not just because we have a year’s worth of sugar in one month! Ok so that does add to it a little. My birthday is on the 7th December and it has been a tradition that we have decorations out before that day since was a kid. Due to a busy schedule this year, they came out particularly early and I broke my own rule and started on the 28th November. This was only for fear that they may not get done until a couple of weeks in to December, shock horror! Thanks to those of you who joined me for my Facebook live to start furnishing the tree. If you weren’t there you can catch up. 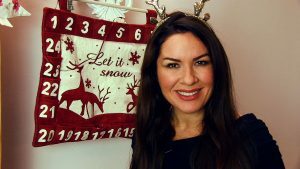 I also did a live chat on colour schemes for Christmas which you can watch here. You need to be logged into Facebook to view these. Whilst I’ve been spreading glitter around the house like the set of Strictly Come Dancing, I have realised there are a few staple decorations I’m particularly happy to see after their hibernation. I bought my husband an advent calendar many years ago and each year I pick out some of his favourite chocolates to wrap in foil to fill it up. Yes I could just buy a new one each year, but I love the fact this shows more effort. He gets extra special chocolates and less packaging is wasted. It also doubles up as a really bright and cheery decoration that has become an old friend. It goes particularly well with my grey and red Christmas colour scheme in the kitchen. Yes it changes just for December! Try here for something similar. This year I changed the decor in my lounge quite considerably. It went from muted, very safe creams to teal and orange. This posed somewhat of a problem considering my decorations were mostly white to suit the former scheme. 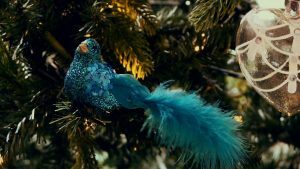 It was with a huge amount of joy I stumbled across these awesome little glitter birds. It was almost like they’d been sent by the decoration angels to save me. OK that’s a little dramatic. I knew my husband would hate them so I snuck them in so he would be able to see the final effect. Although he is not exactly as smitten as me, he conceded that they do look quite good. Here are some similar birds you could add to yours. 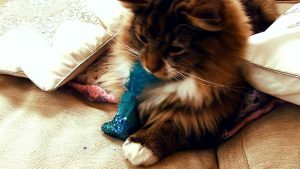 For anyone who follows this blog you will be aware of the running joke of how many cushions I have in the house. So it is with great pleasure I add yet more during the month of December. These ones are just so gorgeous without being too blingy. I just think it’s a lovely way to get more sparkle into the room, but am very strict they go away in January! Marks and Spencer have a lovely selection of Christmas cushions as well. An already candle heavy house frankly becomes a fire hazard in December as the flames multiply. 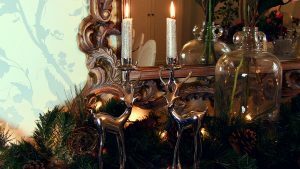 So I was beside myself when I came across these reindeer candlestick holders. Again I just think they’re quite classy, but add shine and Christmas cheer to the kitchen table. I’ve also managed to find the most awesome Xmas glitter candles to go in them this year – just in case there wasn’t enough already in the house! I bought mine from Ruxley Manor Garden Centre. I’m not sure if this was meant for the front door, probably, but for me it takes pride of place on the coffee table. I just think the centre of the room is such an important spot that you need to go large with something to remind people what time of year it is! This one circles a candle vase I have throughout the year, but it is a real show stopper. 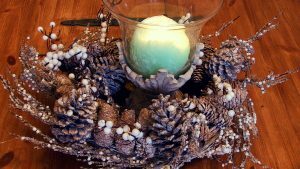 So if you have a wreath you love, why not think about making it a table centre piece to really fill the room with Christmas cheer! I love this one from Etsy as well. Fancy a peak at last year’s Christmas video?